Yowhatsapp has been one of the most famous modified version of WhatsApp in the race of WhatsApp modifiers. It is developed by Yousef Al-Basha. As it is much similar to the original version but with some extra and cool features added to it .like, record voice messages, send multimedia files such as photos and videos but in the modified app there has an increment in limitations of sending multimedia images the size of images documents and videos, text messages, within this mod app now you are 100% ready to chit chat with more than a person by the help of group conversation or create groups. This feature is not only for audio calls it is for video calls too. Isn’t this sounds amazing? Of course, it is. Can send any file in spite of its format and size: we can send data of over 700 MB whether ZIP, APK, DOC, PDF. New privacy tricks including PIN, pattern or fingerprint are also introduced in the mod version. Now you can also see who is calling you from the other side. New big font family introduced you will love all of them. Step 1: Go to WhatsApp and create a backup of all your conversations from the Settings. If only you want to keep them for future with you after you’ve installed this MOD app. Step 2: Go to the Settings of your android phone and then go through to the Application section you have to uninstall the official WhatsApp app. Step 4: Do uninstall it; otherwise, it won’t let you install YOWhatsApp because the system will spot it as a duplicate app on your android phone. Step 5: Download the Yo WhatsApp apk file. Step 6: You’ll again need to go to the Settings menu and then enable the download apps by Unknown Sources in your Security options. Step 7: After completing the whole installation process when downloaded, open it from the notifications bar. Step 8: Go through your downloads folder in file explorer. Step 9: Then tap on “Internal Storage” >> “Downloads”. Step 10: Just hit on YOWA app icon to launch the installation process. Step 11: Once the installation process has been completed. You have to fill the necessary information at the very start. That’s all you are ready to enjoy the features of this cool mod app YOWA. The theme feature of this mod app is so fascinating that it got popular easily among its users. The best thing in this mod app theme feature is that we can change it to time to time, not like the original one that has a by default theme with it. A similar WhatsApp mod, FMWhatsApp is also available which can do the same. Hope you are done with the whole installation process and filled the Initial info needed. Then follow these essential steps. 2. Hit the three dots present at the corner of the YOWhatsapp. 3. Now you will have a list of sections/options to go. 4. You have to go to the “YOMODS” option you find there among all, then tap. 6. If you want to download a new theme you can download it from there. 7. If you have already have themes present in your phone you can also install there (XML file). 8. And if you want to keep it simple and sassy, you can delete all the earlier settings of themes. This is very easy as you know. 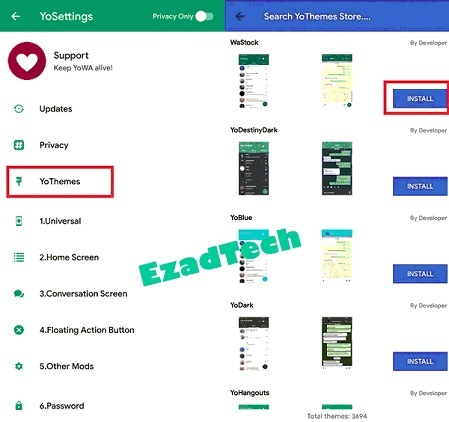 You can try many WhatsApp themes from YoThemes store. 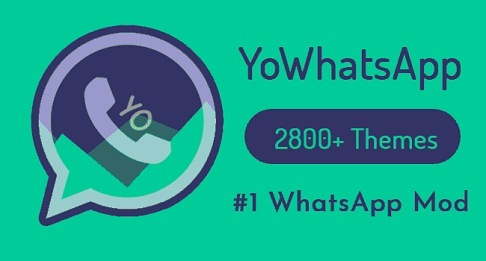 I hope you enjoyed reading this article on YoWhatsApp themes and find it interesting. Do comeback to our blog more tips and tricks on latest tech stuff.